Glycerine, Citric Acid, Natural And Artificial Flavors, Silicon Dioxide, Maltodextrin, Malic Acid, and Sucralose. Mix one (1) level scoop with 8-10 fl oz of water, up to twice daily. Allow 4 hours between servings. Don't use in hot environments, for rapid weight loss, or during intense exercise. Stay hydrated. Drink 64 fl oz of water daily while using Super Sauna™. ALLERGEN WARNING: This product was produced in a facility that may also process ingredients containing milk, eggs, soybeans, shellfish, fish, tree nuts and wheat. CHECK WITH A QUALIFIED HEALTHCARE professional before using this product, or any dietary supplement, if you are under the age of 18 or if you have any known or suspected medical condition(s) and/or are taking any prescription or OTC medication(s). Do not take if you are prone to overheating or dehydration. Do not use in hot environments, for rapid weight loss, or during intense exercise. Always try to consume at least 64 fl oz of water daily while using this product. DO NOT USE IF SEAL IS BROKEN OR MISSING. KEEP OUT OF REACH OF CHILDREN. Glycerine, Maltodextrin, Natural And Artificial Flavors, Silicon Dioxide, Citric Acid, Malic Acid, Sucralose, Red Beet Powder (for color). 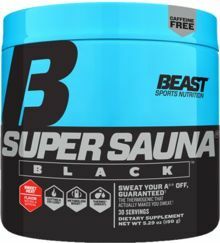 Apr 04, 2018 Beast Super Sauna Thermogenic Powder – Get Your Towel Ready!